Larvae are approximately 1/4 inch (7-8 mm) long and vary in color from a yellow-white to dark brown, depending on age. The upper side of the last 3-4 abdominal segments is covered with dense tufts of spear-tipped hairs. These hairs may be a source of irritation to sensitive individuals who contact or ingest the larvae. 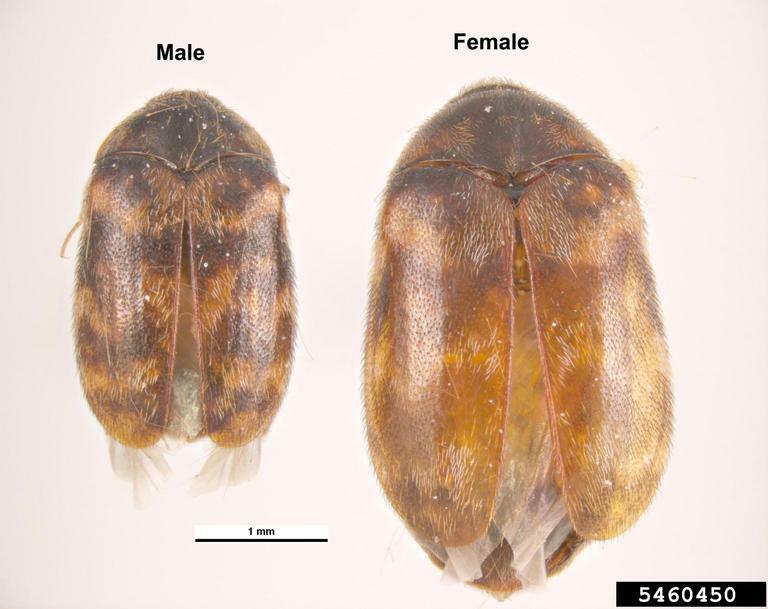 The adult beetle is variable in morphology but is typically brownish black and about 1/8 inch long (3.2 mm). 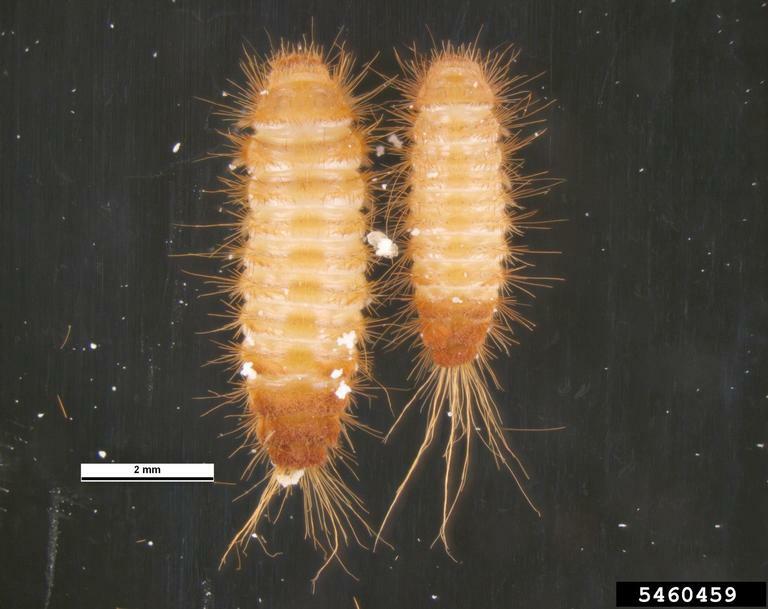 This insect is closely related to the khapra beetle (T. granarium), which is under quarantine restriction. Insects in this group are very difficult to identify and probably should be submitted to an expert for determination. Warehouse beetles, unlike the Khapra beetle, can fly. Eggs are laid singly and are deposited loosely in processed commodity or in the crevices of whole kernels. The average duration of the egg stage is 7 days. There are normally 6 larval instars, but mature larvae can diapause. Molting can continue at irregular intervals. The percentage that diapause increases from 32% to 67% when exposed to room temperature daily and this increases to 80% when handled/disturbed daily along with room temperature storage. Diapausing larvae may delay pupation for as long as 2 years. If a larva does not diapause, it requires approximately 34 days to pupate. Males generally pupate after 1 less molt than females. Pupation generally occurs near the surface of the food. The larval skin splits but it is not cast off. Pupal development occurs within this split skin and requires 4 days. Adults will remain in the last larval skin for up to 7 days and mate shortly after emergence. Maximum adult longevity is 100 days and this occurs at about 12.8°C (55°F). The average life span ranges from 9 days at 40°C (104°F) to 50 days at 17.5°C (63.5°F). This insect is very cold tolerant. Larvae are not killed by a 6 day exposure to 1°C (33.8°F), 10°C (50°F), or 20°C (68°F). Adult survival is also high at low temperatures, but oviposition is inhibited. Maximum oviposition occurs during the first 3 days at 30°C (86°F) (150 eggs per female), and then declines rapidly. Warehouse beetles are voracious feeders. They have been reported from seeds of all kinds, dead insects and animals, cereal products, candy cocoa, corn, corn meal, dog food (dried and ‘burgers’), fishmeal, flour, oatmeal, milk powder, spaghetti, spices, peas, wheat, barley, and pollen. In grain, they cannot feed on whole grain, but can feed on broken kernels that are usually present.